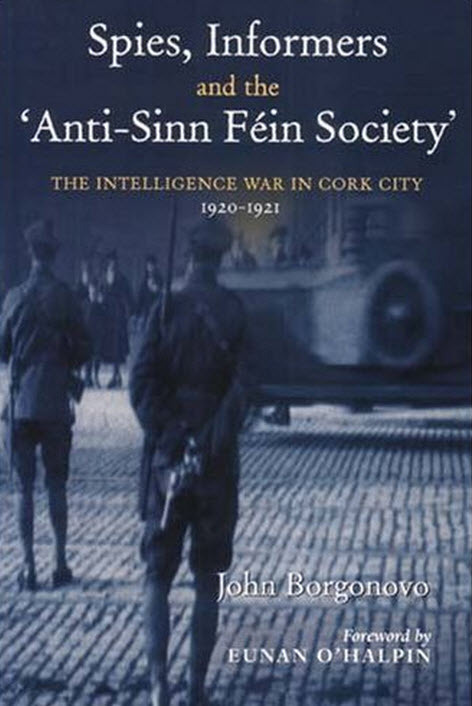 John Borgonovo is among a handful of international historians to have studied Ireland’s War of Independence with the focus on a specific part of the conflict, in this case the crucial Intelligence struggle in the south-western region of the country, notably in Cork City and County. This revealing new account shines a bright light on this dark and murky covert world of espionage and counter-espionage, of competing spy-rings and networks, and examines in detail the belligerent role played by sections of the British Unionist minority in Ireland, in particular through active collaboration with the British Occupation Forces both as spies and counter-insurgents. With many tens of thousands of Irishmen having served in the British military and paramilitary police forces, both in Ireland and overseas, and with the Unionist minority in Ireland reliant on continuing British rule in order to maintain their `colonial’ privileges, it is hardly surprising that the British found a rich vein of sympathy and co-operation within this frequently militant population, as they struggled to control the majority of the Irish people and their support for Sinn Féin and the Irish Republican Army (IRA), mandated as both were by a string of electoral landslides – which of course the British refused to recognise. Borgonovo’s book will be a revelation to many readers unaware of the activities of the broad Unionist community in `southern’ Ireland during the 1916-1923 Revolution, in stark contrast to their more obviously violent and infamously anti-democratic `northern’ compatriots. While Unionist terrorist organisations like the Ulster Volunteer Force (UVF) are well known and documented their counterparts in other parts of the country are largely forgotten, and Borgonovo looks at the `Anti-Sinn Fein Society’ as well as several other shadowy groups linked to the British Forces (plus numerous individual informers, traitors and collaborators). Their wide range of counter-insurgent activities, spying, kidnapping, torture, assassinations, house burnings and multiple murders, are presented in detail and with a great degree of fairness and contextual placement. Borgovono goes out of his way to present all arguments, often giving the benefit of the doubt to individuals where circumstantial evidence alone would point to guilt. His use of original source materials is scrupulously detailed and no statement or claim is made without solid backing. Where tentative suggestions are made, or facts remain unclear, he does not hide the fact but rather draws attention to it, clearly leaving it up to the reader to decide themselves based upon the evidence. This kind of academic honesty is highly refreshing and is one of the real strengths of the book. Borgonovo also addresses the case made by others, most notably the controversial right-wing writer Peter Hart in several of his more infamous publications, that there was a sectarian and racist element to the Irish Revolution in the Cork region, and that the IRA deliberately targeted civilian members of the British Unionist minority in the area. This claim has been taken up by a number of British Neo-Colonial historians in support of Britain’s case that it had the right to rule Ireland, to the benefit of the Irish people, and has been described by them as a campaign of `ethnic cleansing against Protestants’. To Borgonovo’s lasting credit he methodically demolishes this particularly nasty and insidious web of anti-Irish propaganda, stripping it of all pretence to academic integrity, and showing it to be the politically motivated counter-factual history that most rational people know it to be. For taking on the lunatic fringe of British apologist historians, and their Irish offspring, and showing the false and worthless nature of their conspiracy theories we should be eternally grateful to Borgonovo. For those wanting to know more about the particularly bitter struggle in the Cork region between the Irish Republican Army and the British Occupation Forces during the War of Independence, Meda Ryan’s award-winning ‘Tom Barry: IRA Freedom Fighter’ is an excellent place to start.